Last week, the escalating conflict between Israeli forces and Hamas finally ended with a seemingly stable ceasefire on July 21, though not before several people were reportedly killed along the Gazan border. In Iraq, anti-regime demonstrations escalated further, leading security forces to crack down harder on the increasingly violent and widespread agitation (for more on this, see this recent ACLED piece). In Iran, Kurdistan Free Life Party (PJAK) militants reportedly killed ten border personnel in retaliation against the alleged assassination of one of their members, while in Yemen the situation remained relatively unchanged as Al-Qaeda in the Arabian Peninsula (AQAP) and Islamic State (IS) militants continued to battle in Al-Bayda governorate, and Al-Houthi militiamen fought with UAE-backed and Saudi forces along the west coast and Saudi border, respectively. However in Syria, regime and allied forces made significant gains in the Dar’a and Quneitra governorates through both military and diplomatic means, and Russia and Turkey came to an agreement to evacuate the towns of Kafraya and Foah in Idleb governorate. In Israel and Palestine, the escalating conflict between Israeli forces and Hamas grew more fatal following the killing of an Israeli soldier by a sniper on July 20 as well as continued mortar and airborne incendiary attacks into Israel from across the Gazan border. The Israeli military responded with a barrage of artillery fire and airstrikes targeting Hamas militants and local groups launching incendiary devices, leading to at least three reported fatalities. Hamas and Israel both agreed to a ceasefire on July 21, which was brokered by Egypt and UN mediation. At the same time, demonstrations continued throughout Gaza and the West Bank, several of which ended in clashes with Israeli security forces. On July 20, a Palestinian protester was reportedly killed, and 120 others injured, when Israeli security forces used live bullets to disperse a demonstration in Gaza city. As has been the case in the past, this response will likely lead to further unrest. 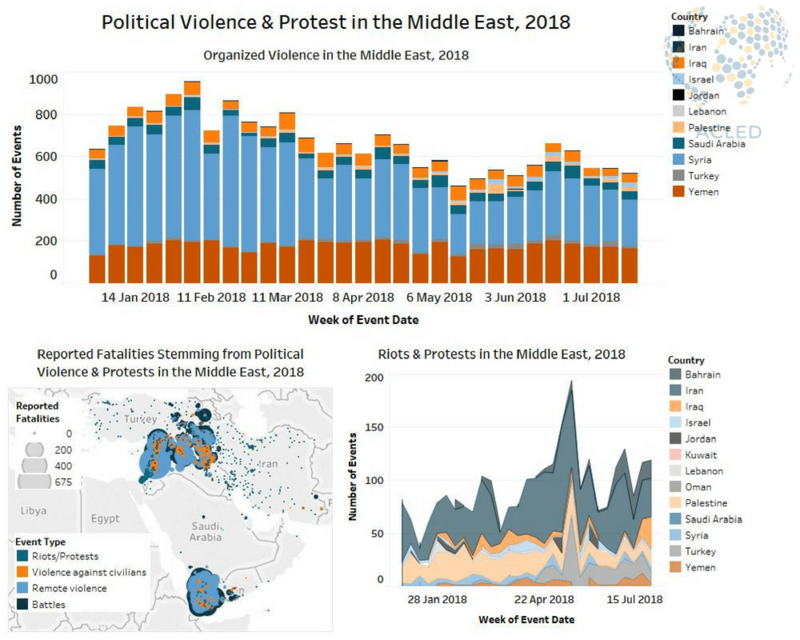 In Iraq, the unrest also continued last week as the number of anti-regime protests against government corruption and a lack of services increased significantly. As the unrest continued to spread out further from the southern provinces where they began approximately two weeks ago, the demonstrations also became more lethal. In all, eight demonstrators were reportedly killed by security forces last week, with a major clash taking place on July 15 in the southern city of As-Samawah, capital of the Muthanna governorate, reportedly leading to three deaths and over one hundred injuries among the demonstrators. Additionally, the attacks on political and provincial offices have also continued as part of the agitation, although no casualties have been reported as a result of these attacks. In Yemen, clashes between AQAP militants and IS gunmen, which began the week before in Al-Bayda governorate, continued last week and into the first part of this week. AQAP forces reportedly took control of several sites formerly controlled by IS. Meanwhile, battles between UAE-backed soldiers and Al-Houthi militiamen continued to rage on the outskirts of Hudayda and Zabid city. Clashes also continued between Al-Houthi and Saudi forces – joined by their pro-Hadi militia allies – along the southern border of Saudi Arabia and in the northern areas of Yemen’s Sadah governorate. Finally, a number of assassination attempts targeting Salafi and Al-Islah political figures, as well as local police officers, were reported in the southern city of Aden. The city is home to a number of rival armed groups and is a frequent site of battles and bombings as a result. In Syria, regime and allied forces made significant advances on the remaining rebel-held territories in western Dar’a and Quneitra governorates last week. They reportedly captured around forty towns and villages and reached surrender and evacuation deals with both rebels and Islamist groups. Significantly, one of largest remaining rebel-held cities of Nawa, near Da’ra’s border with Quneitra governorate, was retaken as part of the agreements. Large-scale evacuations began in both governorates to move civilians and rebels who refused to deal to the Syrian northwest. Meanwhile, it was in the northwest that Russia and Turkey came to an agreement to evacuate the Shiite-majority, rebel-besieged towns of Kafraya and Foah, which began in earnest on July 18 for pro-regime militiamen and civilians. The agreement included the regime release of detainees as well as a Russian guarantee not to begin new operations in Idleb province, provided that Turkey hands over the part of the Damascus-Aleppo international highway that runs through it. Under the agreement, Turkey will also take control of Tel Rifaat city in northwest of Aleppo province where People’s Protection Units and Iranian forces currently operate. In other parts of the northwest, Syrian Democratic Forces gained control of at least twelve villages across Deir-ez-Zor and Al-Hasakeh governorates from IS fighters. Finally, in Aleppo province, suspected Israeli warplanes carried out strikes on regime, Hezbollah, and Iranian Revolutionary Guard Corps positions near Nayrab airbase. Twenty-two people were reportedly killed.